Yesterday I never would have believed it, but today I know it’s true: there are few things in the world more dangerous than making a piece of buttered toast. I know. You’re right. It sounds ridiculous. But if you’d been in my kitchen this morning, you wouldn’t be rolling your eyes right now. 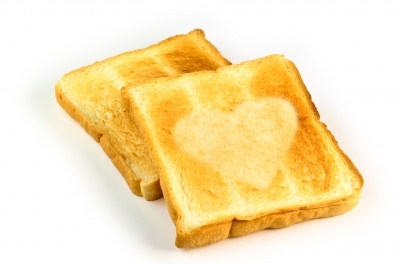 I was in a hurry, as usual, and a quick piece of buttered toast seemed like the easiest breakfast. (I was so naive then.) I should have realized something was wrong the second I opened the bread drawer. It hadn’t ever made that clicking sound before. Of course I ignored it. Did I mention I was in a hurry? (And so very clueless.) I grabbed a slice of bread from the bag and retied it, all without even noticing the claw marks on the crust. When the toaster popped, I pulled the butter tub out of the fridge without looking. Which meant I never saw what was looking back at me. I tossed the bread onto a napkin and got out a butter knife, still humming. (Actually humming!) Then I opened the tub of butter and got my first wake up call. There was a big bite out of the butter. Not a swipe of the knife. Not a divot from a finger. Not even a lick. A big bite. The kind where you can see the mark of each tooth. I may have screamed. I don’t really remember. I may have jumped back. I definitely dropped the butter knife on my toe. For about ten seconds nothing happened. Then a rumble from the fridge collided with a click from the bread drawer. I may have screamed again. It’s all a bit blurry. I definitely jumped back and hit my head on the kitchen cabinet. I know this because I was still seeing stars and trying to decide if I should call my neighbor or the police or the doctor or an exterminator when the refrigerator door burst open and the..thing…leaped straight toward me. It landed on the floor by my feet, too horrible for words. I got a quick glimpse of green and orange eyes and teeth that were…no I really I can’t talk about it. But before I could die of a heart attack, the bread drawer flew open and this….arm…reached up and grabbed the toast off the counter and quickly disappeared. The…whatever it was…from the fridge leaped toward the drawer and disappeared inside, taking the tub of butter with it. The drawer slammed shut, and everything was quiet. Outside, with the door shut behind me and the sun shining down, my hands were shaking, but not too much to Google “creatures that click and hoard bread” and “monsters that eat butter.” The two go together apparently. According to all the message boards, they’ll live happily ever after. In my house. Until the bread and butter are gone. Then they’ll move on. So if you need me for the next week, I’ll be at the hotel down the street. All because I had to buy stupid bread and stupid butter to make my stupid toast because I was in such a stupid hurry. Image courtesy of cjansuebsri at freedigitalphotos.net.